It will leave your legs, face, or armpits soft. 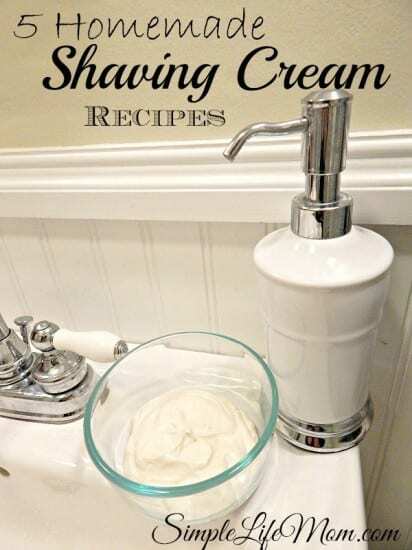 To research this article, I went to look at the ingredients of store-bought shaving creams. You guessed it, they were bad. Super bad! Remember, your skin is your largest organ and it is great at absorbing everything you put on it! What really upset me was that there are a number of shaving creams on the market claiming to be healthy and natural, but are quite the opposite. Time to break out the ingredients and make some of your own! Now, there are zillions of recipes out there on the web. Most of them are some variation of each other. Which is fine and great. I made each of the main variations and changed them to make them better (or so I believe). I DID have a problem with some of them though. The most prevalent recipe you will find is similar to my recipe for Shea Butter Lotion. This makes a fluffy cream to spread over your legs and makes for a silky shave. The problem is that this puts A LOT of solid oils straight down your drain. Whether it be my husband at the sink, or me in the shower, the drain has to deal with all that solid oil. No amount of hot water you run is going to make a difference just a little ways down the pipe. And you do NOT want to have to find where that clog is in your yard! So, if you still want to use the fluffy lotion method, here’s the recipe. Like I said, it’s an awesome shave, but don’t say I didn’t warn you about the pipes! Slowly add melted coconut or sweet almond oil while whipping. These recipes are all fabulous. You can put them in a jar or a normal pump container and just shake it before each use. Or you can find a cool foam pump like THIS ONE. or buy a cheap 5 dollar or less one at a local store, dump the nasty contents, and use the container over and over again. You can make just enough for the size dispenser you have, or make extra and store it in the cupboard until needed (highly recommended). I love this recipe because I always have these ingredients on hand, I can make a bunch, and the coconut oil adds that extra moisture and smoothness for my legs. If you do not have fractionated coconut oil (used so you don’t get a hard clump of coconut oil in your container), you can substitute another oil like olive, sweet almond, apricot, or grapeseed. This one makes a great shaving cream, just make sure your are using healthy shampoos. 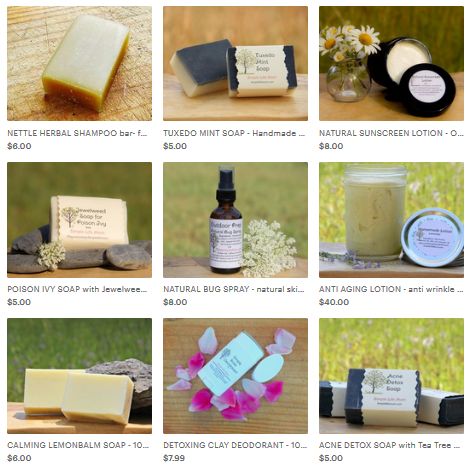 Check EWG database or my post on best to worst non-organic shampoos. Oooh, cocoa butter, honey, and sweet almond oil! A Great combo! I really liked the feel of this one. A must try! Aloe is very soothing, inside and out. Using a aloe gel and soap combo makes this a great foaming gel for shaving. 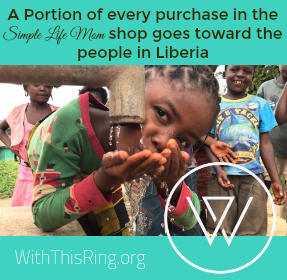 Linked to some of these amazing blogs! Thanks for these recipes! I’m almost out of the bad conditioner I’ve been using as shaving cream and was wondering what I was going to replace it with. These looks great, I can’t wait to try them!! Thanks for sharing at the HomeAcre Hop. Pinned to our HomeAcre Faves Board! Thanks for this! I’ve gotten in the habit of just using straight-up coconut oil, which feels lovely, but it does clog the drain up from time to time. So my husband would probably thank me to try something different! Clarifications question: In the lotion recipe, the ingredients are shea butter, almond oil, and essential oil. However, the direction step #2 states: “Slowly add melted coconut and sweet almond oil while whipping.” Was coconut oil supposed to be in the ingredients list? If so, how much? Thanks. Thanks for catching at. It should say “or”, not “and”. Coconut makes it thicker. You can use any combination that equals 1/3 cup. With the water content, how long is the shelf life in each of these recipes? 3 months – it varies longer or shorter depending on how much bacteria or oils are introduced via hands. Tried the shampoo/ conditioner recipe and it will NOT come out of my foam pump. Any suggestions? It’s like the foam pump gets clogged or something. Also, where did you get your foam pump? I got my pump on amazon. If you added regular coconut oil and your house is around or cooler than 76 it will get hard, making it harder to pump (fractionated coconut oil is great for this project). You can add more oil like an olive oil to thin it out. You can use mango butter. Cocoa butter is too hard… You can possibly find some other butters that are softer that are similar to shea. Hi Kelly! For the first recipe do you think coconut oil or almond oil has the closest consistency to store bought foam shaving cream? Thank you so much! Either one. It’s really whipping air into the shea butter that makes it fluffy. Just continue to whip until you get the consistency that you want. 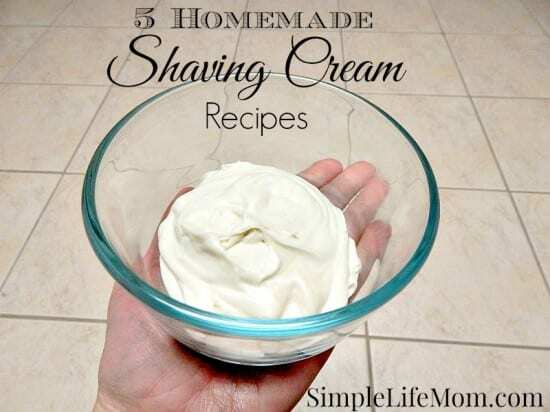 For the Lotion Shave Cream – I’m considering making and giving as gifts to teachers and administrators at school. What is the best type of vessel for gifting? A 200 ml mason jar or something wider and shallower? And how much is recommended to use per use? thanks so much. Yes, a 200ml or 250ml container will fit the recipe (8oz). I prefer a wide outh container for easy removal. Amount used varies on skin type, but 2 tablespoons can easily cover my entire body. A little goes a long way. Not sure if it’s been too long since you posted to ask a question, but here goes. 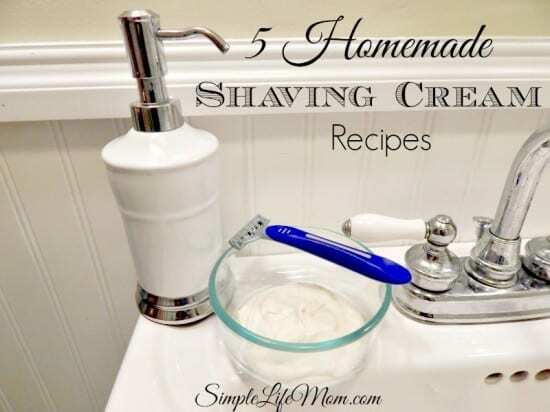 I made the Simply and Lovely shaving cream. First, I made some for my husband. Came out great. I made some for myself and it was nice and foamy. Went to use it this morning and it had solidified. My husband’s is still foamy. The only difference between the two is the type of essential oil. His is lavender and mine is peppermint. Any ideas? It’s more likely a slight difference in oil amounts combined with whipping time instead of the essential oils that you used. Even slight variations can make a difference. Did one sit where it could get more steam or heat from the shower than the other? That can also make a difference. Can the first recipe be put in a foam pump bottle? You can always add more oils to thin the recipe to where it works in a foam pump. Just remember it is oil based instead of water based as the pumps are designed for, but I’m guessing you can make it work. Which version of recipe can I make with out worrying about pipes clogging? #2, 3, and 5 are soap based and dissolve better for plumbing.